I’ve been open about my problem with cookbooks and food magazines regarding how I can’t stop collecting and reading them. Well, I also have an issue with collecting links to recipes I see on all those fabulous food blogs out there. The list of recipes keeps growing. Fortunately, a perfect opportunity for trying some of them presented itself. Bread Baby mentioned an upcoming bake sale and asked if anyone in Austin would like to donate items. She, in fact, had organized a very cool benefit for Space12 and planned a bake sale as part of it. What could be better than getting to try a few different recipes from my list and then having a place to take the baked goods to prevent me from eating them all? I wasted no time in combing through that long list of links and decided on these: cinnamon cappuccino cookies from A Kiss and a Cupcake, molasses cookies from Cooking During Stolen Moments, and banana snickerdoodles from Noble Pig. I didn’t realize it when I picked those cookies, but they all have something in common. For all three cookies, balls of dough are formed and then are rolled in sugar or a sugar mixture before being placed on a baking sheet. I had the technique down after these recipes. The cinnamon cappuccino cookies have powdered espresso in the dough, and then the dough balls were rolled in cinnamon and sugar to which I added a little more espresso powder. 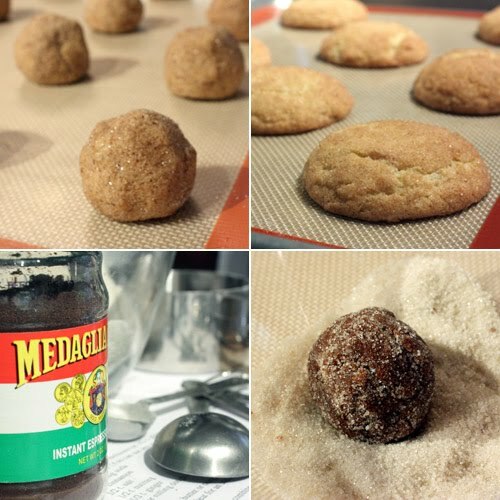 The molasses cookies were rolled in sugar, and the banana snickerdoodles were rolled in cinnamon and sugar. I made one change to the banana snickerdoodle recipe which was to use butter instead of shortening, but I always do that. These were three very different cookies in the flavor department, and I liked them all for different reasons. I’ll be keeping all three recipes in the permanent file. Kurt’s favorite, hands down, was the cinnamon cappuccino. I thought for sure my favorite was going to be the molasses cookie because I’ve become so taken with molasses in recent years, and it was extremely good. In the end though, I was torn between it and the banana snickerdoodle. The banana snickerdoodle dough was ridiculously good, and I almost had to restrain myself from eating the entire bowl before the cookies could be baked. Since I clearly can’t pick a winner among the three, I suggest you bake them all and let me know which one you like best. Hey Lisa! These all look great, in fact I may make the banana snickerdoodles today! I found a great way to organize all of those recipe links I was collecting. Do you use Delicious to bookmark sites? It's really cool because you can set bookmarks and access your bookmarks from any computer, plus you can share your links with other people. You just go into Delicious and create a tag bundle with all of the tags that you'd like to use to organize your recipes. Name the bundle something like Lisa's Cookbook. Then, when you come across a great recipe, don't worry about saving it as a favorite or printing it out, just bookmark it on Delicious using one of your tags, and voila! You have your own online cookbook. It makes it so easy to find a recipe you saw but can't remember where to find it! Hi Lisa.. I love cookies, especially with my coffee. They all look wonderful and bake sale worthy!! Anything coffee flavoerd I would try. Those cinnamon cappucino sound yummy! BigSis: Great tip. I've just started using Evernote which is similar. So convenient! so pretty looking cookies!! gorgeous!! Oh, I love Snickerdoodles! Both cookies look fantastic! I'd buy those in a heart beat. I'm a little cookie monster at heart. I have the same problem, too. regarding collecting recipes. I have so much to look through and it does kind of get a bit overwhelming sometimes, for me at least. But I love it. These look wonderful! I can have all of them with a cup of milk. YUM! Wow, these little guys look fantastic, and I share you cookbook, magazine, blog problem, oye. If only there was a way to consolidate them all, I try different then cannot remember where anything is located. I need to give it another go and it sounds like delicious or evernote is the way to go. This is great what you made for the bake sale. I have tons of cookbooks, magazines and links. I guess this is our passion. We NEVER have cookies in this house because I eat them all & I'd weigh a ton by now. Best kept out of my sight. Your cookies look absolutely professional for sale. I have been flicking through old food magazines last night too, need bookmarking as will forget easily. What a good trick, I myself sometimes invite people just to have the chance to cook something I like and not eat it all myself... more or less your problem. And the cookies look fantastic! I have a mood for cookies and I could have some of those right now, with a cup of coffee... Perfect! 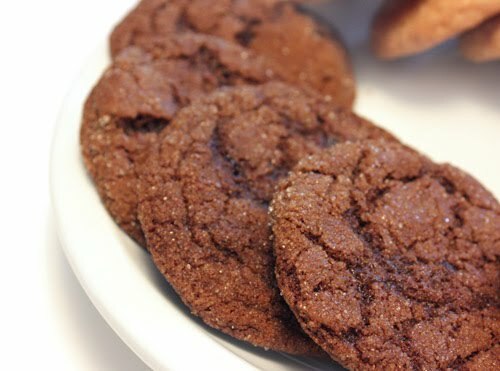 I would think I'd prefer the molasses cookie too, but they all look so yummy! All three cookies look great. I want to start with the cinnamon cappacino. Have to start somewhere. Love all the delicious beautiful cookies, yummy! Wow, what a delicious cookies Lisa. Wouldn't mind to have these at my home all year long. 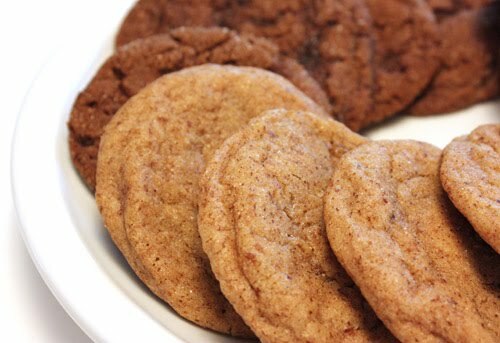 These look delish, i especially love the look of the molasses cookie. Im going to go look up the recipe now. If you send me some samples I could help you pick a favorite! They look so yummy! I really like the sound of the banana snickerdoodles. So unique. I don't think I've ever eaten a banana cookie. mmmm espresso in the cookies, they look so perfectly chewy and perfect! Banana snickerdoodles, wow, I'm in heaven. Must make these! 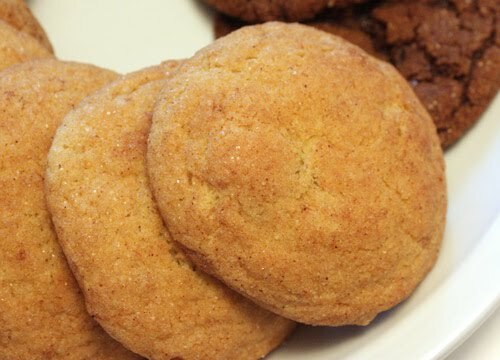 Oh my, I'm struck by the delicious notion of the banana snickerdoodles. I'm saving these recipes for the holidays -- the perfect excuse to make all of them.